At Halton Heritage Services, we’re all about working together with our community of heritage partners in sustained relationships of co-creation, collaboration and radical trust. In the last three years, we have engaged with community partners on exhibit development, building animation projects and school-age learning partnerships. Community partnerships are essential to our work at Heritage Services because we no longer operate a traditional museum, but they’re also an important best practice for all museums. These relationships serve to open up the museum to new audiences, instill a sense of ownership and bring new voices and perspectives into the institution. Collaborative partnership projects are a lot of work, they take more time and effort, but they also produce a better product, more accessible history, offer ways to connect with new audiences and are just more fun. Since 2014, our organization has transformed from a traditional settler-focused local history museum into a community-based heritage service provider. Like a traditional museum, we still care for the Region’s collection of artifacts and archival materials, create travelling exhibitions and deliver outreach programs. To those core activities, we’ve added professional services in exhibit planning and design, public program development, collections management and artifact conservation for regional heritage partners. When we embarked on this new approach, we looked around the museum world for inspiration and found no shortage of innovative partnership projects – from exhibitions at the Santa Cruz Museum of Art and History and Toronto’s Myseum to community-connected education programs at the Ogden Museum of Southern Art and the Albright-Knox Art Gallery. As a means of exploring what we’ve learned about this new approach to making heritage happen at the community level, I am going to discuss three collaborative projects Heritage Services has undertaken since 2017. In January 2017, Heritage Services began working on a partnership project with the Royal Canadian Legion Branch 136 (Milton) and the Fine Arts Society of Milton to assist with documenting and re-interpreting a significant collection of artifacts and memorabilia in Branch 136’s Remembrance Hall. The goals of the project were to make the Legion’s collection more accessible to the public, build awareness of the Legion’s mission and share stories of Milton’s wartime contributions. Like many Legions, Branch 136 had accumulated an impressive array of military artifacts, but the collection wasn’t fully documented and had languished since the departure of the volunteer curator many years before. The objects and the stories they held were neither physically nor intellectually accessible to the public nor Legion members. Along with a new committee focused on revitalizing Remembrance Hall, Heritage Services staff set about inventorying the collection while the gallery spaces were renovated by the Legion’s community partners. We were able to conserve, stabilize and properly store many of the objects, some of which had suffered the ill effects of excessive light and temperature over the many years of exhibition. Once physical control of the collection was established, the next step was to research, design and fabricate an exhibition featuring the Legion’s First World War collection for the anniversary of Vimy Ridge in April 2017. 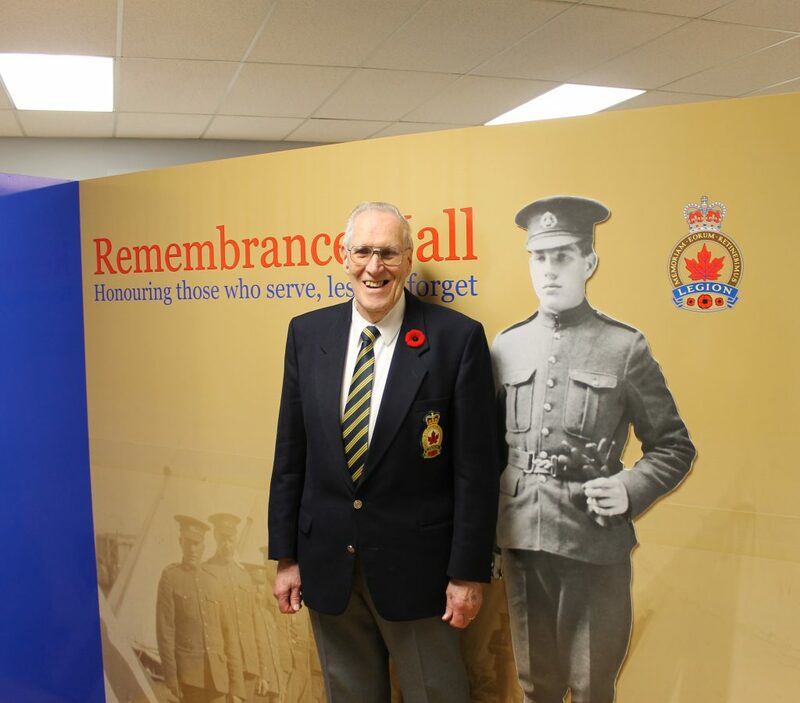 With the official opening of the revitalized Remembrance Hall space and the First World War exhibition, Legion members and the wider public can now more easily access the many local stories contained within the Legion’s large collection of artifacts. Like many of Heritage Services’ partner projects, our work with the Legion is continuing. We’re currently working with their committee to plan for the next phase of exhibitions in Remembrance Hall, which will share the story of Milton and the Second World War with the wider community. The Mattamy National Cycling Centre (MNCC) in Milton, Ontario, built as a community legacy project for the 2015 Pan-Am Games, is the premiere indoor track cycling facility in the country. This space is a world-class cycling centre and an innovative community facility enjoyed by locals and visitors alike. In addition to myriad cycling events, the MNCC hosts many community and cultural events ranging from high school graduations to charity fundraisers, with annual visitation in excess of 300,000. In 2017/18, the venue hosted a round of the Tissot UCI Track Cycling World Cup and will do the same for the next two years, with the 2020 event including the UCI Para-Cycling World Championships. 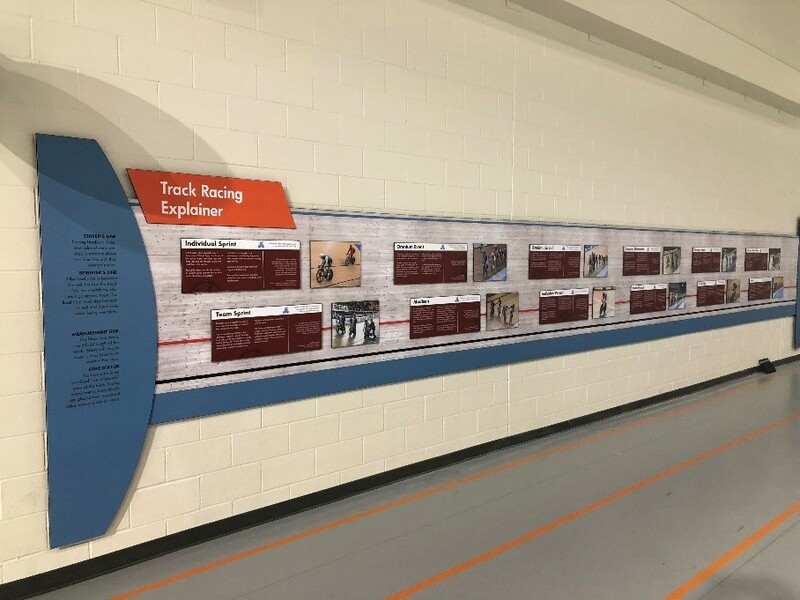 The Track Racing Explainer interpretive panel was the first element of the building animation exhibit project to be installed at the MNCC. The facility is architecturally impressive, technologically advanced and is home to the country’s leading track cycling athletes, but the space itself “lacked a certain amount of heart”, which is where the Coordinator of Track Cycling and Events asked for Heritage Services’ assistance. The MNCC’s goal for this multi-year building animation project is to inspire visitors to participate in the cycling community, give visitors a greater understanding of the different facets of the sport and celebrate the traditions of cycling in Canada. With the expert input from MNCC staff and insights from top Canadian cyclists, Heritage Services completed phase one in October 2018. This initial installation was designed to explain what spectators see when they watch bicycle track racing and to highlight top Canadian athletes in the sport. Future project phases will examine the social history of cycling (featuring a mid-19th century velocipede from the Halton Heritage Services collection), address the science and engineering inherent in the sport and empower visitors to get involved in one of the many forms of cycling. School-museum partnerships are nothing new – school field trips are the cornerstone of many museum education departments and represent an important revenue stream for heritage organizations. However, Heritage Services doesn’t have any dedicated gallery space of its own. Like the exhibit partners mentioned above, we have sought out partnerships with teachers and schools to create authentic learning experiences directly in our community. Our Partners in Time program came out of a one-time project Heritage Services worked on with grade 12 history students and their teacher, Shawn Brown, from Acton High School in 2014/5. The new and re-imagined version of Partners in Time maintained the hands-on and collaborative nature of its predecessor, with an increased focus on personalization, creativity and providing more open access to museum programming and resources. In fall 2017, Shawn contacted us again to create a school-based, student-curated exhibition with his grade 10 history students. For this project, students selected items from their own lives and experiences to be used in the exhibition, rather than historical items from our collection. Not only would they be better equipped to tell stories about the objects to which they had a personal connection, but by situating their objects within the larger story of their community, the idea of “the museum” was made more accessible, immediate and relevant to their lives. Each student was tasked with curating an individual exhibition, to be installed in empty lockers in a school hallway. After participating in exhibition design and storytelling workshops, the students began crafting their own exhibitions, with design and fabrication support from Heritage Services staff. The students chose objects, wrote text and designed materials, which Heritage Services produced, resulting in a student-created exhibition that opened for the wider community at a school holiday event. 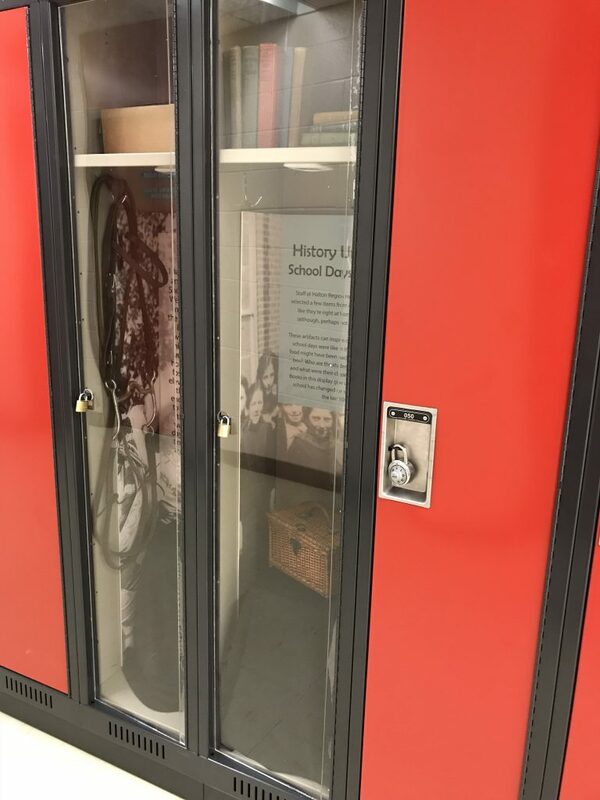 The project proved to be quite popular, with Acton classes from spring and fall 2018 also creating locker-based exhibits. We’ve expanded our partnership to include two additional secondary schools and are currently supporting more than 200 student curators across the Region. What Have We Learned? And What’s Next? Our organization is still learning, prototyping and experimenting with different partnership models and exploring ways to engage in partnerships that are more inclusive and reflect the diversity of our community. We have learned some very valuable lessons thus far, upon which we are building as we move into new projects. First and foremost, we’ve discovered that non-traditional partnerships can result in a more widespread and distributed model of heritage within a community and offer opportunities for our audience to discover “heritage” in unexpected locations. Partners like the Mattamy National Cycling Centre have helped us broaden the definition of heritage and expanded the platform for where it can happen. Exhibitions are one of the most powerful platforms a museum has to offer – sharing this power, authority and skill with a wider community ensures that the exhibits and programs Heritage Services create support the goal of opening the museum up to a wider audience, engaging new voices and empowering our community to share their expertise, stories and experiences. Partnerships have led our organization to be more imbedded in our communities and support, facilitate and enable storytelling by others, rather than telling their stories ourselves. We have learned that we don’t always have to lead a project, but that we do have valuable skills and resources to share with others. We’re still learning how to be a good partner, how to best support others in telling their stories and reaching out to new people. We’re excited to see what stories students from four new Partners in Time schools will tell and see the next phase of projects with existing partners while continuing to grow our reach, share history and provide higher level of service to our residents. The case studies I’ve highlighted here are only a few of the innovative community partnerships museums are working on. Are you working in partnership with a museum or cultural organization? Tell us about it in the comments. Similarly, if any educational institutions, heritage or arts organizations are interested in collaborating with Halton Heritage Services on a project, please reach out. Meredith Leonard is currently the Interpretive Services Coordinator at Halton Region Heritage Services. A certified teacher with more than ten years of experience in the heritage field, she has championed museum-community collaborations in her previous work at the Museum of Ontario Archaeology, Fort Erie Museum Services and the St. Catharines Museum & Welland Canals Centre. Meredith holds a Master of Museum Studies from the University of Toronto and a Master of Science in Adolescence Education from D’Youville College. She currently teaches in the Ontario Museum Association Certificate in Museum Studies program and sits on the Board of Directors for the Workers Arts and Heritage Centre. Thank you for these examples – our genealogy group is exploring ways that we can have more meaningful role in our communities, and these ActiveHistory stories will provide inspiration for a more outreach, partnership based approach.